Note: This bottle was provided FOC specifically for a review. As I’ve mentioned before and will certainly say again: I love when liquids are put into barrels. It always results in amazing things happening. 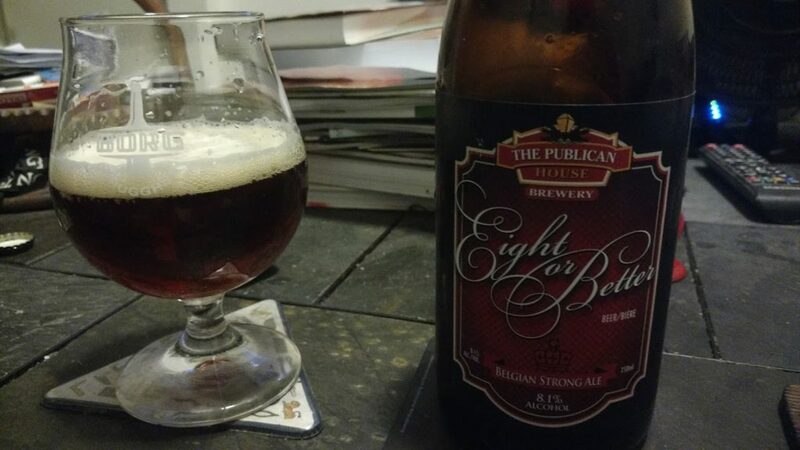 One such amazing thing is the Eight or Better beer by The Publican House. This is a “strong ale” which I personally think is closer to a quad that has been aged in barrels for a year at the brewery. We drank this beer pretty soon after bottling but would recommend you age a bottle for a bit before trying it. This beer is only available at the brewery and prices change. It sits at 8.1% ABV. Appearance: Copper colour with off-white head that fades fast. Filtered. Aroma: Spicy and yeast forward. Cinnamon and coriander. A bit of cherry. Taste: Cinnamon and dark chocolate. Candied sugar. Alcohol warmth, not really hidden. Aftertaste: Lingering and sweet but not over the top. Overall: A good Belgian quad, pair with lamb or duck. Buy a couple and age them.